For a movie that involves such popular talent as Steven Spielberg, Peter Jackson, Edgar Wright, Jamie Bell, Daniel Craig, Andy Serkis, Simon Pegg and Nick Frost, “The Adventures of Tintin: The Secret Of The Unicorn” is receiving a remarkably small amount of buzz. Part of the reason is that few people have ever heard of “The Adventures of Tintin,” the Belgian comic series on which the movie is based. The other reason is that the movie isn’t due in theaters until the end of 2011. 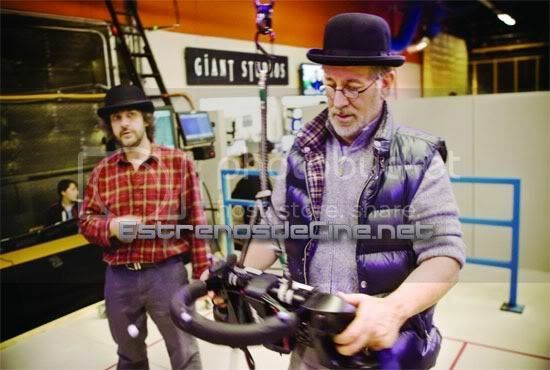 Estrenos deCine has a picture from the set of the movie, which is the first in a planned series of three films in 3-D motion capture. From left, Peter Jackson and Steven Spielberg. You can count me in the number of those who had never heard of Tintin. With such a remarkable group of people involved I’m sure we will be hearing a lot more in the next couple years. Interesting! I never heard of this. Cool! I wish all that talent was going to better use. I’m sort of looking forward to this.